You can open a synonym in the Synonym Editor and provide text for the title, caption, and description in multiple languages. These descriptions appear in the specified language in reports generated against the synonym. 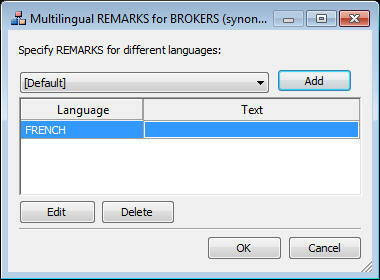 The Multilingual Titles dialog box is available from the Remarks, Title, and Description attribute value fields in the Synonym Editor. From the Projects or Data Servers area, double-click the Master File or select Edit in Synonym Editor from the File menu. The Master File opens to the Field View tab in the Synonym Editor. For Title, click a column from the Master File hierarchy of columns on the left. For Remarks, click the root level of the Master File (application/filename) on the left. For Descriptions, click a column, segment, or custom field from the Master File hierarchy of fields on the left. The corresponding attributes and values appear on the right. Click the browse (...) button at the end of the value field for either Remarks, Title, or Description. The Multilingual dialog box opens. From the Specify Titles/Descriptions for different languages drop-down list, choose the language in which you want the titles or remarks (descriptions) to be displayed. The selected language is added below the default language (which is determined by your code page selection). Type a description or title in the Text field. You may add, edit, or delete additional titles or descriptions. Select another language from the drop-down list. Type a title or description for the field. Select the title or description and click Edit. You may also double-click the title. Manually type a title or description name. Select the title or description and language to be deleted. Click OK to close the Multilingual Titles dialog box. To close the synonym, select Close from the File menu or click the control button in the upper-right corner.